Howdy, Log Rhythms and log cabin fans! It’s time to update you on all that has happened since last August regarding the Solitude cabin! I would like to say our family is finished with the cabin, but we are not. This is largely due to one busy family and yet again, weather delays. Even so, we are nearly done. But, I’m going to go back to the 2016 Labor Day weekend. That’s when our entire family took over the interior “finish-out” of the cabin. Our building crew had packed up their RVs and tents and taken off for Montana. We were all traveling in various vehicles to get to the Reserve from our main homes as dusk hit on the Friday before Labor Day and then, we were at a dead-stop because of one bad crash on a narrow bridge on the U.S. highway closest to Solitude. You know it’s a bad sign when the CareFlite helicopter nearly lands on top of you! We consulted with the police on-scene and they told us an alternate route to take. Because this took a while to do, we wound up at the cabin in total darkness. That shouldn’t be a problem, right? Wrong. The exterior doors had no door knobs and the builder had constructed interior ways of keeping people and varmints out of the cabin. And because our light switches illuminating said doors were inside, we were forced to use car headlights to figure out a way into the cabin. Inside were no interior doors, one laundry sink in one bathroom, one toilet, and plywood floors with lots of leftover construction dust. We didn’t even have a shower rod or curtain for the tub/shower combo in the bathroom. I had brought a microwave and dorm refridge left over from when our kids were in college and brought some linens and inflatable beds with me (and hotel soaps, etc.). We had to construct “temporary” interior doors with tension rods and twin bed sheets and big safety pins. And we had to plug in night lights and lamps to see where we were going because no interior lighting had been installed. We ran to the store, got some supplies, including a shower rod and curtain and hooks and constructed what we needed that night. Let’s just say it was a while before we all got to bed! 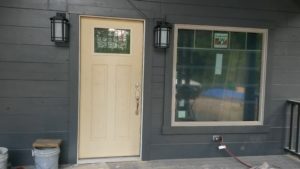 Of course, this exterior door situation was a problem as well as the interior lighting situation. Thankfully, the eldest is a pro when it comes to these matters, so by the end of the day on Saturday, we had beautifully-installed door knobs on all the exterior doors. By Sunday he had begun to install the interior ceiling lights and that helped tremendously! The DSL and our youngest helped the hubby all weekend with sanding the interior walls and ceiling timbers so they could be stained. I don’t think this was their favorite job, but they did this well! Thus, the next few weeks I will take you through the various steps that have already been completed so that you’ll know where we are as of right now! Hopefully, by the time I’ve caught you up, we’ll be done with all of the interior work! People are so excited to stay at Solitude and we are excited to welcome them. I think creating a master calendar of who is coming when will be necessary soon! This entry was posted on Wednesday, June 21st, 2017 at 3:41 pm and is filed under Log Rhythms. You can follow any responses to this entry through the RSS 2.0 feed.